With help from our new and used Huntsville, Alabama, Kia dealership, motorists can take on the road like never before, as we'll have sleek 2020 Kia Telluride vehicles available as soon as they hit the market! This vehicle is able to stand up to the challenges of the road, what with its 3.8-liter V6 engine that can tow up to 5,000 pounds when properly equipped and it's 8-speed automatic transmission, so if you're looking for new cars for sale near Madison, stay in touch with our auto dealer for important release date information! Our team can review the benefits of the Electronic Parking Brake and the four different drive modes that the Telluride will offer (Comfort, Sport, Eco, and Smart), as well as the perks that the Torque Vectoring Cornering Control provides. Experience this commanding vehicle for yourself, schedule a test drive at our Kia dealership as soon as this Kia hits our showroom! 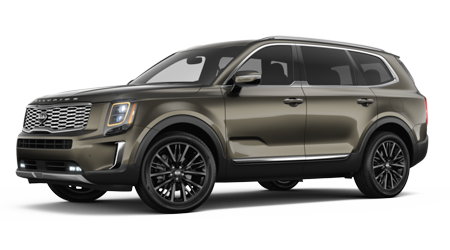 If you want to upgrade to a 2020 Kia Telluride as soon as the lineup becomes available so that you can enjoy a vehicle that offers smartphone compatibilities, Driver Attention Warning and Smart Cruise Control with Stop and Go, team up with our Kia dealership near Decatur, Alabama! Here at University Kia, we provide drivers with the fair auto appraisals that they deserve, making it easy to upgrade to one of our new cars. Feel free to value your trade-in online now so that you are ready to snag a 2020 Telluride as soon as it is released. With a variety of interior amenities, including Forward Collision Avoidance with Pedestrian Detection, steering-wheel-mounted audio controls and reclining 3rd-row seats, this is a vehicle you won't want to miss! Should you also be interested in professional financing services, we have you covered there, too! Our new and used Kia dealership in Huntsville has a dedicated finance center that can help you drive off our Kia lot with a Telluride as soon as we get them in stock. Don't hesitate to get started with one of our online credit applications so that you're ready for this SUV when the time comes!